“Police!” The African American shouted at the train station in Richmond, California. The gang ran away, much to my relief. My legs were aching as I tried to walk up the stairs out of the train station with all my luggage. Many people have warned me that running marathons relatively untrained is a life-threatening event. But I am convinced my life was a lot more threatened by finding myself in one of the most violent cities in America, I was alone and unable to walk properly after running 42.2km that morning as a part of the California International Marathon. Perfectly good relationships get often strained due to social media. Keeping up with the “Likes” and “Loves” becomes a chore, like doing our laundry, so we aren’t always responsive on friends birthdays anymore. Also, people that know us get annoyed that we often unknowingly post a glossy version of ourselves. It’s the nature of posting. Even though we spend 90% of our time working and parenting, we usually feel more of an urge to post in the 10% when we are traveling, skydiving or having a wonderful time in our relationships! Therefore, I thought this trip was a perfect contrast to what actually happened on my trip to Sacramento, California from Vancouver, Canada when I found myself here in the most violent city in the US, where kids get paid for not killing each other! After the marathon, I rushed to the hotel to get my stuff and started fantasizing in my mind the food options the train station might have on my way. When I arrived there, there was no food nor time, so I boarded the train from Sacramento to San Fransisco on an empty stomach. There was also no food sold on board. To add salt to my wounds, the train just stopped for no good reason on several occasion. One reason was that 3 of the world’s slowest towboats had to get through and the train tracks went vertical for the occasion. At this point, I thought the failures of the day were comical since the morning of the marathon, I hadn’t signed up for the marathon the night before as I arrived in late, and had paid for breakfast at the start line, but the bus which was supposed to deliver us to the start of the marathon didn’t show. So I made friends with 3 people at the front of the line and they allowed me to join them in their Uber. Luckily I arrived 15 minutes before the marathon, managed to speed eat some food before starting the race. However, due to the frequent train stops, I missed my connection from Richmond, California to San Francisco International Airport. I started trying to call an UBER after the gang members had left the station because of a police raid. At this moment the mobile data on my phone stopped working. I am standing there with aching legs, no ride to the airport, and the police had gone away. The gangsters started to approach the station again and I was trying to focus on solutions rather than cry and I concluded that my well-being was better served by accepting a shady cab driver offer to take me to the airport for an $80 cash deal (The Uber would have been $40). “Cash only,” says the driver, whose car he referred to as taxi, despite not having any picture of any license or anything else that I expected in a taxi. I struggle to get into his dirty car as my legs are screaming at me to give them a break. I tell him I will take out cash at the airport. He informs me of the peculiar fact that there are “no ATMs at the airport” in broken English. I try to argue without any luck. He then wastes a precious 10 minutes driving into a shady part of town to get me to withdraw cash. And he says “you will be at the airport in time”. This statement was truth because after I got the cash, he started speed-driving to San Francisco International Airport. In the seat-belt free backseat I tried to use the United App to check in as my mobile data started working again. The first message I got is that I need to pay a cancellation fee for that UBER driver that had apparently been ordered before my internet connection was lost, and secondly that the app refuses to check me in, but I try at least 8 times, without any luck. I know I need to be at the airport 60 minutes before my departure. Instead of reflecting on how my life was in the hands of this stranger, I decided to focus on the beautiful pink sunset in San Francisco Bay to calm my mind. I don’t know if it was the adrenaline, but it was an incredibly beautiful sunset that day. The cab driver never intended to stick to our $80 dollar deal and started screaming at me that he had to pay a toll and requested $120 dollars from me when we arrived at the airport. With my surroundings having changed, now we did have airport security and other passengers around rather than some violent gangsters in Richmond. Empowered with my fight or flight response, I tell him (probably rather loudly), a deal is deal and repeated that I only had $80 dollars, as he continued to shout back, I simply walked away with a sense of relief, that I had made it to the airport before the check-in closed. Despite the traffic jam, and my argument over locations of ATMs, and haggling over how much he was going to overcharge me, I make it in time to the airport on time. I limp over to the United Airlines counter, and the lady asks me for my passport. “You are not on this flight.” the ticket officer says confidently. I felt my heart pumping a bit harder. She continued that it looks like my ticket is a standby ticket and this flight is fully booked. My mind drifted to the incident that became infamous when a United Airlines staff violently forced a passenger out of his seat. “Here is my reservation,” I said. “ And I am DEFINITELY on this flight.” She probably sensed that I was going to cause a fuss, so she kept trying to make it work and had to make at least 3 trips to the back where they try to sort out the situation. After about half an hour of back and forth, she finally has a boarding pass for me. After this difficult situation, I was exhausted, and went straight to work the next day and got sucked into everyday business. It took weeks for me to tell friends and family in person how this trip went. Life is busy. But I thought this story was the perfect example of the illusion we live every day with FB. The bottom line. 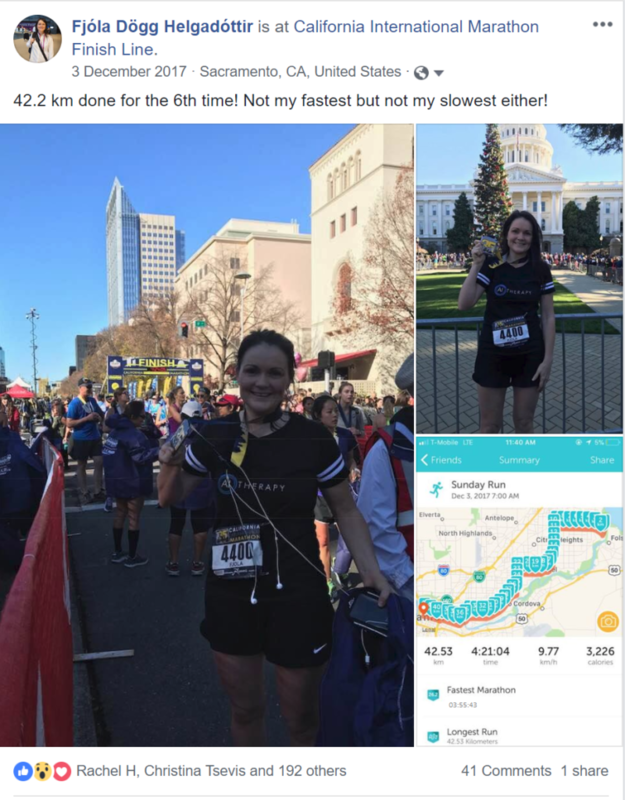 I ran another marathon according to Facebook! The rest is the real world, and when you struggle with mental health issues and social anxiety, the comparison to other people’s lives is even a larger illusion. 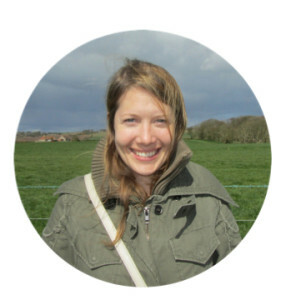 Fjola Helgadottir, PhD, MClinPsych, Postgrad Dip, BA is AI-Therapy’s director and co-creator of AI-Therapy’s Overcome Social Anxiety. 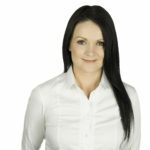 Twitter: @drfjola is a fully registered clinical psychologist who is running Dr. Fjóla & Kompaní in Iceland and Dr. Fjola Helgadottir Psychology Corp. (R.Psych) in Canada, who has previously worked as a clinical psychologist in Australia and at the University of Oxford in the UK. She has completed 6 marathons and visited 84 countries in the world. This is a pretty big deal since the trial shows that AI-Therapy’s Overcome Social Anxiety has approximately triple the mean effect size of 6 stand-alone, internet-based CBT treatments for anxiety and depression (Cohen d=0.24) found in a meta-analysis! Another amazing was that comparing AI-Therapy’s Overcome Social Anxiety to 19 therapist assisted computerized intervention, was that AI-Therapy showed comparable results. In other words, even though therapist support appears to contribute substantially to the effectiveness of computer-delivered CBT for anxiety, our findings indicated that Overcome Social Anxiety is comparably effective to therapist-assisted interventions when delivered as a stand-alone treatment. We have known for a long time that AI-Therapy is highly effective, since the program administers pre-post data for its users. But this trial adds to its credibility, since independent researchers at the University of British Columbia tested the program in a randomized control trial. We have lots more in the works for 2018, so please keep an eye on the site! Also visit our Publication page for more information! Fjola Helgadottir, PhD is AI-Therapy’s director and co-creator of AI-Therapy’s Overcome Social Anxiety. Twitter: @drfjola. 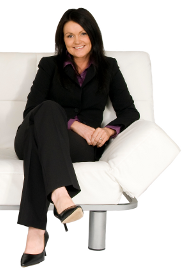 Dr. Helgadottir has worked as a clinical psychologist in Sydney, Australia, Oxford, England and Vancouver, Canada. She will be opening up a new service in Iceland in 2018. Being in front of people makes you anxious. Sometimes so much so that you can’t speak your mind in social situations, and sometimes skip out on activities altogether. But that’s not the only way social anxiety is holding you back. When all you can think about is how fast your heart is beating, or how much you might look like an idiot if you say the wrong thing, it’s hard to focus on what’s going on during social interactions. Social anxiety makes it nearly impossible to reach out to others or interact with them in a meaningful way, for fear of making yourself look bad. After a while, you might begin to feel lonely because you aren’t able to interact with people without severe anxiety symptoms. Worrying about all of the things you might do wrong, or something you said years ago will cause a lot of stress to build up in your body. Most of the things you worry about when you have social anxiety are things other people don’t remember, or don’t think are a big deal. All of that build up stress can start to take a toll on your body. If you’re stressed out enough, it can cause you to experience physical health issues that you have to address. Some of these problems include heart disease, headaches, gastrointestinal disease, and faster aging. How many times have you stayed home from a party or an event because you were too worried about what people would think of you? 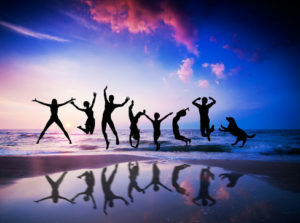 One of the most common regrets people experience in life is not going out and experiencing more when they were younger. You too might start to regret the things you don’t do after a while. While there are some people who might think you’re a little odd, most of the time people don’t remember you outside of their interactions with you. Most people are so focused on themselves that they won’t notice, or won’t care, if you say something weird, or don’t respond in a certain way. When your anxiety gets really bad, it can start to tell you what other people think about you. “That person thinks you’re annoying” or “this person thinks you’re stupid”. There’s no way to tell what other people think, and in most cases, it’s hard to make someone think poorly of you. Have you gone to an interview for your dream job, only to never hear back from the potential employer? Maybe you haven’t experienced exactly this situation, but there’s probably one thing or another that you’ve missed out on because your social anxiety prevented you from interacting in the best way possible. Good friends will try to be understanding of what you’re going through. But when you keep canceling on outings, or constantly tell your friends that you can’t make it, they start to think you don’t like them, or that you’re never going to show up. Many of them are busy, and don’t have the time to keep trying to get you to come along. And after a while, they might stop reaching out to you. Social anxiety doesn’t have to hold you back in so many areas of your life. With AI Therapy’s program “Overcome Social Anxiety”, you can take advantage of years of research through lessons created to help you get control of your fears. Implementing some of these techniques will help you to get your life back, and start connecting with people in a meaningful and lasting way. Last week was an interesting one, to say the least. It seems like there was non-stop stories about the havoc in the White House. One story didn’t get as much attention as the others (for obvious reasons), but it caught my eye because it made me think about cognitive behavior theory (CBT). I’m talking about Trump’s theory that the body works like a battery. He believes that people have a fixed amount of energy for their whole life, so we should avoid exercise and not overexert ourselves. To back up his theory, he points to all of his friends who exercise and need to get hip replacements and other medical procedures. Trump believes this theory, and he “feels” it is correct. Therefore, he decides to not exercise himself. What does this have to do with CBT? Post-event rumination is a central feature of social anxiety. This means that after a social event someone with social anxiety analyzes the interactions in detail to try figure out if they have done or said anything wrong. The problem with this approach is confirmation bias. If we try to uncover evidence for our “social errors” we will find it. This is not because something bad happened. Often we “feel” like we have said or done something that has upset someone. However, just because we feel or BELIEVE we have done this, it isn’t necessarily true. 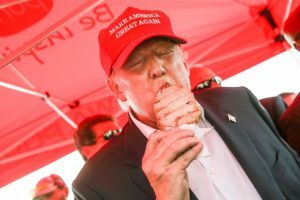 We are looking for supporting evidence after the fact, just like Trump and his exercise theory. What can we do to help make better decisions in life? One of the key ideas behind CBT is to become an evidence based thinker. For the exercise theory, a single google search would find scientific articles contradicting the theory. We don’t need to understand the importance of peer reviewed science to understand the many compelling arguments for cardio exercise, such as longevity, mental health etc. In some situations like this we need to trust our gut instincts less, and our brains more. The same idea applies to looking at post-event rumination. Rumination can become a habit. One may believe it is a useful strategy to make sure they didn’t “slip up” in a given situation. However, this is not productive, and we need to work out a way to limit the time spent ruminating after social situations. We have to understand that most of the time we simply have no idea what another person is thinking. In other words, when we feel they are thinking poorly of us, this is usually without any direct evidence. It is just a product of our own minds, and is best ignored, just like Trumps theory on exercise! More great news from AI-Therapy! There are currently several studies in progress designed to test how well the program works. The latest study, from the University of British Columbia, is showing impressive results, adding to the growing pile of evidence backing up the program. These preliminary results are based on students who participated in a randomized controlled trial. The work was led by Dr. Frances Chen and Dr. Chris Richardson, with Hugh McCall and Keith Patena running the day-to-day operations. Hugh will be presenting a poster on the preliminary results at two UBC research conferences (MURC & PURC). The predecessor to AI-Therapy was created during my PhD from 2007-2011. For my thesis I designed and programmed (in PHP!) a program targeting social anxiety among those who stutter. After completing my studies I saw enormous potential for this field. I wanted to build state-of-the-art, evidence-based mental health treatment programs available to the everyone. Therefore, in August 2012 I launched AI-Therapy with the rebuilt “Overcome Social Anxiety” treatment program. Since our launch in 2012 we have been growing organically, without external investment. The reduction in social anxiety symptoms we see among our users has been fantastic. For the statistical nerds out there, the effect size is 1.8, which is exceptional. However, user data is not a replacement for proper randomized control trials. Therefore, these latest results from UBC are an exciting validation of what we are seeing with our users. “Nothing else has ever helped me as much as this CBT program. I struggled with social anxiety for most of my life, and it has certainly held me back from experiencing life to its fullest. I began this program feeling very hopeless about my situation, thinking nothing could change my mindset and that my life would never be worth much. Now, I have the tools to fight the anxious thoughts and feel very confident about my future.” (Anonymous). We all have stereotypes about people with social anxiety. A lot of people falsely believe that social anxiety is the same as being shy. However, this isn’t always the case. In fact, quite often I’m asked “How can I have social anxiety when I’m such a social person?” These are people who enjoy being the center of attention, and who have a constant stream of funny stories and interesting things to say. People like this can actually be the most socially anxious people in the room. Here is the key to understanding this: people can have social anxiety about different things. Everyone is unique. For example, some people are very confident in job interviews and with regards to the performance at work, but are terrified at the thought of making small talk in the lunch room. On the other hand, some people are very chatty and sociable with their friends and colleagues, but experience debilitating anxiety when it comes to their work performance. Therefore, when clinicians are evaluating social anxiety, it is vital to understand the idiosyncratic differences between people, as these can have a profound impact on cognitive behavioral treatment. People read into these events, and make inferences about themselves. Normally, these inferences involve highly negative interpretations. People take precautions to try to compensate for their perceived limitation of character. In reality, the compensations are overcompensation, and over time these behaviours keep the anxiety going. An example of an overcompensation strategy is “non-stop talking” (hence, the most bubbly person in the room). These people are uncomfortable with silence because they interpret it as “if I’m not participating in the conversation the other person might think I am boring”. It is important to keep in mind that it is not the behaviour itself that is the problem, but the motivation behind the behaviour. It is the WHY that is important. For example, non-stop talking between long lost friends is to be expected. A core part of CBT treatment is to test hypotheses. For example, seeing what happens when you stop overcompensation strategies. It is likely that you find people will accept you for who you are. This is done on an experimental basis, and individuals need to see the point of these experimentation. It is easier said than done, which is probably why therapist have to truly understand the theories behind the strategies they are implementing. This type of overcompensation strategies are known in the literature as safety behaviors or subtle avoidances. I have recently published journal articles on the topic, and I will be chairing a roundtable at the Anxiety and Depression Association of America ADAA conference in San Francisco on April 8th, 2017 titled: Harmful Safety Behavior or Helpful Coping Strategy? Understanding Client Behavior in the Face of Anxiety. We are very pleased to announce our latest collaboration, which is with Dr. Frances Chen and Dr. Chris Richardson of the University of British Columbia (UBC). We will be evaluating AI-Therapy’s cognitive behavior program within the university’s undergraduate student population. 3 years ago I wrote about blog titled: “Is diagnosis necessary for online treatment?“. My answer was no. I believe that anyone can benefit from CBT strategies, whether or not they have an official diagnosis. CBT helps people make better choices in their day to day lives, often leading to an overall improvement in happiness and confidence. 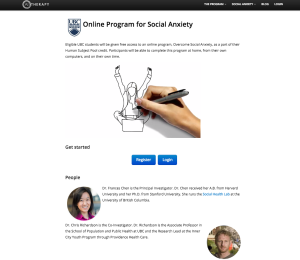 The UBC trial will provide the online social anxiety program to people who have elevated scores on social anxiety, not necessarily a social anxiety diagnosis. We are excited to see the outcome of this research.